The first 25 minutes for BYU, it seemed the only wrong they could do was commit penalties, but it didn’t matter, ’cause they could make up for them. The rest of the game, BYU looked average at best. For the entire game, both BYU and Houston looked mistake prone. BYU seemed able to overcome the mistakes and score early, while shutting down Houston. But they couldn’t get a touchdown in the third quarter and they couldn’t clean up their mistakes. BYU will lose two or three games this season if they play every game with as many mistakes. Houston had a nice drive in the second quarter for a field goal. BYU struggled to stop them. It seemed the BYU defensive coordinator stopped calling blitzes. The BYU defense went away from what was working. Pressure John O’Korn, Houston’s QB, and he couldn’t sustain a drive. Under pressure his passes were extremely inaccurate. Rush just a few and give John O’Korn time and he picks and pops down the field. This was obvious after a few first downs using only three or four pass rushers. We needed a fifth blitzer. But the defensive coordinator didn’t fix it until the red zone. Soon enough to hold Houston to three points but not to stop them. Poor defensive coaching gave Houston their start to get back into the game. Will Robert Anae ever learn? Last year in the Virginia game with 6 minute left he made the same mistake. The opposing team can’t score. You’re forced into a third and seven. I remember chanting “Run it an punt it. Don’t make a mistake. Run it an punt it.” Virginia was demoralized by the BYU defense. BYU was running over five yards a play in the 4th quarter as the Virginia D was tired. The BYU D was dominant. Run the ball and there is no interception. Sometimes “run it and punt it” is the smartest move. Especially when your offense is struggling and your defense is dominant. A run would have resulted in either a first down or punt and BYU wins against Virginia. Even if the run had resulted in a fumble, Virginia wouldn’t have scored a touchdown from midfield. It wasn’t just the interception that helped Virginia score, it was the run back that gave them a short field. Sometimes conservative play is the right answer Anae. Taysom shouldn’t have needed to run 26 times. Half of those runs were pass plays that should have been called as running plays in the first place. If the offensive coordinator, Anae, would have let the running backs take over with 3 minutes left in the second, the game would have stayed at least 23-3, though the BYU running backs may have scored as Houston was demoralized already. No huddle offense or not, it is poor coaching to not know when to get behind the running backs and bowl over a demoralized team. The BYU offensive linemen love to run. They should have been rewarded with some good old fashioned running with 3 minutes to go in the second half. BYU probably would have run for a touchdown or rushed close enough for a field goal, but even if not, BYU would have gone into half 23-3. But Anae had to call a passing play in a DO NOT PASS MOMENT and they gave up two touchdowns to Houston due to offensive mistakes in three minutes. Maybe after five straight runs, you could have changed it up and surprised them with a pass, but not on first down in a DO NOT PASS MOMENT. Still, credit the Houston defense for blocking the pass and catching it after it popped up! So after getting bit for being greedy for points, BYU (Anae) could have easily gone to half 23-9. One would expect the offense to hand off the ball to Williams and run out the clock. But BYUs offensive coordinator, Anae, repeats the same mistake. And his offensive gives up the ball again, which leads to a second Houston touchdown. This type of poor coaching is going to hurt BYU. Taysom was overworked and put in danger in the second half. These decisions could have lead to another Taysom injury. Greediness for points has cost you (Anae) and your team multiple times in your career. You got lucky this time, but you put your valuable QB in jeopardy doing it. Come on Anae. Learn! I am calling out the coaches (Bronco, Anae, Poppinga, Howell, etc. ), I’m calling out the captains (Hill, Lasike, Bills, Peck), and I’m calling out the team. Please accept a goal for Virginia to have only 7 penalties. Less than two a quarter. If your team wins and you are still complaining about the refs. There is a problem. If you disagree with calls that go your way, there is a problem. Sure, the penalties were terrible for both teams many of those penalties were deserved, but a lot of calls were just poor refereeing. The refs were terrible the whole game for both sides. It started before the kick off. The refs were blowing their whistles and the kicker waited for them finish. Then without the kicker knowing it, the play clock was under ten. What were the refs doing blowing their whistles? The kicker obviously waited on the refs. Then the next personal foul penalty on the punt was a legal hit happening just as the ball handler hits the ground. The whistles had not blown. Ever heard the term “play to the whistle?” It was the stumble and falling forward that happened after the whistle. Poor call by the refs. Good physicality by BYU. No call needed. The refs best call was picking up the targeting penalty. But despite the BYU player clearly using the shoulder and clearly lowering his body to avoid the head, the refs made a bad call in the first place. BYU laid wood on the receivers all night, but it was clean wood. With another extremely bad call, the refs did something they should never do. They changed the game drastically and gave momentum to Houston with an extremely poor call–a call that shouldn’t have been made at all. Late in the second quarter, the refs gifted a first down near the goal to Houston. After a turnover, BYU’s defense stops the Houston QB on third down. Well, a BYU player tripped the QB from behind and as the QB falls down, another BYU defender in front goes down with the QB. There is not hard hit. Just a defender trying to stop forward progress. The Houston QB didn’t slide, and he was gaining yards as he fell, so stopping his motion is completely allowed and completely clean. There was no helmet to helmet. Clean play. Nobody would have thought anything of it. But a ref gave BYU a phantom 15 yard penalty and a 3rd down stop became a first down after half the distance to the goal. The refs robbed BYU of a defensive stop unjustly. This leads to the first Houston Touchdown and a huge moment shift. Such calls should NEVER happen. The refs weren’t any better for Houston. A Houston player just gives Taysom a small check to make sure he is out of bounds and it is a fifteen yard penalty. Taysom is running on them all night. They HAVE to make sure he is out of bounds. There should not have been a penalty call on this play. Let them play. I saw a few holds BYU got away with. Of course, calls that should have been made, such as the blatant hold that prevented a sack on the hail mary, were not made. Still, BYU can’t blame the referees for allowing a Hail Mary score. Houston deserves credit for the amazing take away and for completing the 45 yard bomb. The refs sealed their poor calling by calling a lineman for throwing a punch and throwing him out. He stretches out his arm toward another lineman, sure he has a fist, but they often keep their hands in fists on the line. The lineman didn’t connect with anything. It was clearly just a reach to block the defender. And arm bar perhaps. It was clearly just a player playing the game. Wow it has been a long time since I was so completely blown away by poor refereeing that even with my team winning, the poor refereeing is still one of the most prominent features of the game. Except for one more touchdown, it was a sub par second half by both teams. Both scored 10 points. Both looked like average teams. Taysom and Williams looked pretty good and that was all. John O’Korn made some nifty sack-avoiding escapes for a few big plays. BYU had 523 yards. They should have scored closer to 50, but for 3 turnovers. They also had 11 penalties. Sure three of them were phantom calls by poor refs, but 8 penalties are not good either. An ineligible man down field cost BYU a touchdown on their first drive. Taysom through for 200 yards 1 TD and 2 interceptions. He was sacked 4 times. His completion percentage was only 62% and a few passes were just off. He didn’t look as sharp through the air. He did look sharp on the ground however. He rushed 26 times for 160 yards and a touchdown. Williams also rushed 26 times for 139 yards and two touchdowns. BYU rushed for 19 first downs. John O’Korn passed for 307 yards and three touchdowns. Houston only rushed for 10 yards. The game was never as close as it looked. While it ended 33-25, BYU stomped Houston to 23-0 to start and without poor refereeing and poor coaching and an extreme amount of luck (credit Houston for making their own luck) Houston would have never scored two of their touchdowns. Houston was never really in the game. They came out with all the emotion and all the momentum in the second half only to be shutout in the third quarter and the momentum went back to BYU. Houston got another opportunity in the fourth do to great defensive play on an interception. But BYU just had the better defense and stopped them from converting the turnover into a touchdown. The highlight of the game was the straight up safety on Houston’s second drive. The punt stopped at the 3 yard line. Two plays later Zac Stout tackled Houston’s Ryan Jackson for the safety to put BYU up 2-0. Often safeties are caused by mistakes. A bad snap or a player drops the ball and has to fall on it, etc.. Sacks on the QB are fun. But a straight up safety by getting to the running back on a running play is rare. Amazing! I attended this BYU game. I have not been to a game at the Level Edwards Stadium in a few years. It started with a trip to the BYU Creamery. No issue there. Then I went to the book store and was promptly kicked out. “We close at 6:00 PM everyday now,” they said. This is the first home game. Dozens of alumni were in the book store and shocked they had to leave. The book store should have stayed open until game time or at least until 15 minute before. This showed a lack of forethought and collaboration by the school as a whole. Once at the stadium, I noticed the rental seats are blue and padded now. Ten years ago they were hard orange things. Slight improvement. The two nice big screens sure looked good. A vast improvement to the screens since I last attended. At least they would have been awesome except for the noticeable lack of using them to show replays. The screens seem a waste. The quality of my experience didn’t not go up from there. I bought a chicken sandwich at the game. They used to have Teriyaki Sticks and other good places to eat. I couldn’t fine one on the east side. My chicken sandwich had bun and chicken–nothing else. The “fixings” table had nothing for a chicken sandwich, it only had condiments for hot dogs: ketchup, mustard, onions, relish, and jalapenos. If you’re going to sell chicken sandwiches, provide something to put on them. Lettuce, tomatoes, mayonnaise, pickle, anything. There were also no TVs to keep you up to date on the game as you buy food. I bought a Cougartail. A Cougartail is a doughnut as long as your arm. To my dismay, it only came in maple. My son doesn’t prefer maple. I got it anyway. Would it be that hard to have chocolate or glazed? It just seemed everything was done halfway. The whole package just isn’t there yet. All in all, despite the win, the facility, the ugliness of the game, the low quality of the food and facilities were rather disappointing. No wonder the game was far from a sell-out. Even as a huge BYU fan, I would have had more fun at home watching the game on ESPN3. The field had a flag coming out of the Y at the 50 yard line. The helmets had flags. It was a nice moment before the game. Well done. But the night was saved. No, not by the less-than-stellar BYU victory, but by the fact that I attended the game with my son Aiden for the first time. 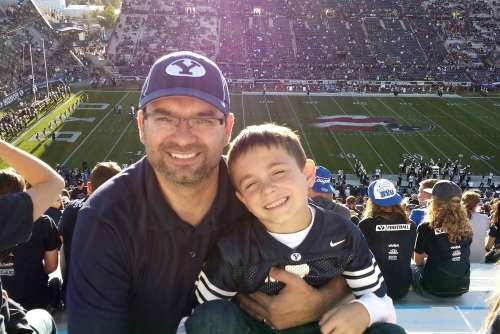 This was Aiden’s first BYU experience. Though rushed out of the book store, we grabbed the first cheap T-Shirt his size. He won’t remember being rushed out, but he’ll remember getting that shirt with his dad. He also got his first cougar tail. He won’t remember wanting a cougar tail that wasn’t maple. Leave a reply on "BYU 33 – 25 Houston ( and my experience at the game)"